Jesse Ellis Lingard is an English professional footballer who plays as an attacking midfielder for Manchester United and the English national football team. Born on 15th December 1992, Lingard is capable of playing as a right winger for the club. The 25-year-old player is rated at € 25,00 Million in January 2018 after undergoing a major improvement under Manchester United’s Jose Mourinho. Lingard was born in Warrington, Cheshire and enrolled in Manchester United's youth academy at the age of seven. Moving through the ranks in the youth team, he was a part of the Manchester United team that won the 2010–11 FA Youth Cup. He was awarded his first professional contract in the summer of 2011 and was included in a senior matchday squad on 30th November 2011, in the League Cup quarter-finals against Crystal Palace at Old Trafford, remaining unused as United lost 2–1. On 4th January 2012, He had his only other call-up of the season, again unused in a 3–0 loss at Newcastle United. On 6th November 2012, Lingard moved to then Championship side Leicester City on loan for a month. He made his competitive debut the same day in a 0–0 stalemate away to Bolton Wanderers, coming on as an 85th-minute substitute. His loan was then extended until 2nd January 2013 and made a total of 5 appearances for the club. He made 3 appearances for the England Under-17 in 2008 and 11 appearances for England Under-21 before making his senior debut for the Three Lions against Malta, starting on the left wing as England won 2–0 after an appearance in the bench against France in November 2015. He was included in the 2013 preseason for Manchester United and scored his first couple of goals against the A-League All Stars in Sydney on 20th July which was the first goal for Manchester United after the Ferguson Era. He also scored against Yokohama F. Marinos and Kitchee SC to finish the tour as the top scorer with four goals in as many matches. Lingard joined Birmingham City on a month's loan on 19 September and went straight into the starting eleven for the Championship match against Sheffield Wednesday at St Andrew's two days later. He scored a hat-trick in just 13 minutes and finished the match with a 4-1 win with all coming from his boots. He returned to his parent club on 11th January 2014 as an unused substitute against Swansea City. On 27th February 2014, Lingard joined another Championship club, Brighton & Hove Albion, on a 3-month loan. He scored his first goal for the club on 8th April, in a 4–1 win over his former club Leicester City. He made a total of 15 matches for the club scoring 3 goals. His 2014-15 season saw his debut for Manchester United as he featured against Swansea City in the Premier League opener which was cut short to only 24 minutes due to an injury. On 7th November 2015, Lingard scored his first senior goal for Manchester United in a 2–0 home win over West Bromwich Albion. On 21st May 2016, Lingard scored the winning goal for Manchester United the in the 2016 FA Cup Final against Crystal Palace, having come on as a second-half substitute for Juan Mata. He made a total of 40 appearances for the club that season scoring 6 goals that season. Lingard scored the opening goal as Manchester United beat Premier League champions Leicester City 2–1 to win the 2016, FA Community Shield. 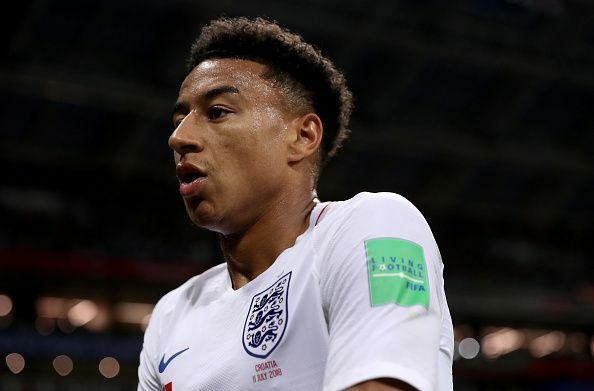 On 23rd March 2018, Lingard scored his first goal for the three lions in a friendly match as England triumphed the Netherlands to a 1–0. Jesse Lingard began his career with Manchester United in 2011 and made loan moves to Leicester City in the 2012-13 season where he featured in 5 matches, followed by a move to Birmingham City where he played 13 matches scoring 6 goals and to Brighton & Hove Albion in 2014 playing 15 matches for the club. On 2nd February 2015, Lingard joined Championship club Derby County on loan until the end of the season and was a part of the playing XI in for 14 matches.